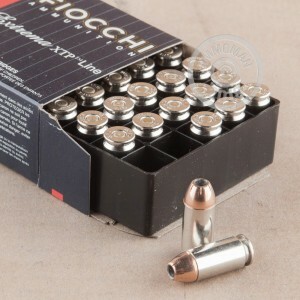 Manufactured by Fiocchi of America in Ozark, Missouri, these .40 S&W cartridges belong to the "Exacta" series of defensive ammo and fire a light 155 grain Hornady XTP jacketed hollow point bullet. The light, fast round provides excellent penetration and reliable expansion while still benefiting from the high caliber and mass of the .40 S&W round. Hornady XTP bullets are a proven defensive projectile widely used in premium ammunition. 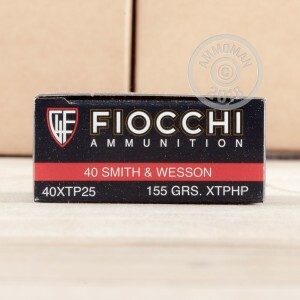 Such ammo is usually quite expensive, but Fiocchi has perfected the art of making and selling this ammo in large, affordable quantities (such as this 500 round case) while maintaining a high level of consistency and performance. Grab your case today and get free shipping from AmmoMan.com!